The SECOND Function is categorized under DATE/TIME functionsFunctionsList of the most important Excel functions for financial analysts. This cheat sheet covers 100s of functions that are critical to know as an Excel analyst. The function returns the second component of a time as a number between 0-59. For example, it will return 49 for 1:19:49 PM. 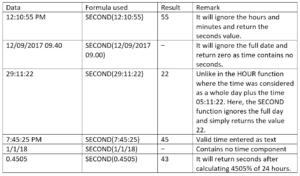 Serial_number (required argument) – The time that contains the second we want to find. 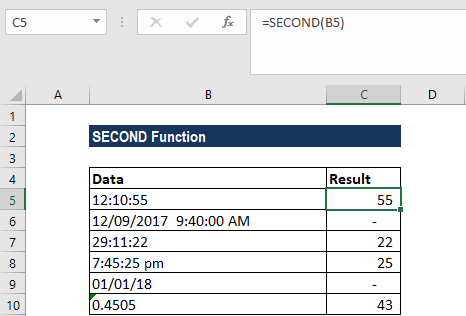 How to use the SECOND Function in Excel?